Borders is set to challenge the Apple iPad, Amazon.com’s Kindle and Barnes & Noble Nook with their own low cost e-reader, the new $149 Kobo. The Kobo, like the Kindle, is a light-weight device with a 6 inch monochrome e-ink display. This compares with the 9.7 inch full color display on the iPad, which can be used for running games, viewing photos and watching movies, in addition to reading books. 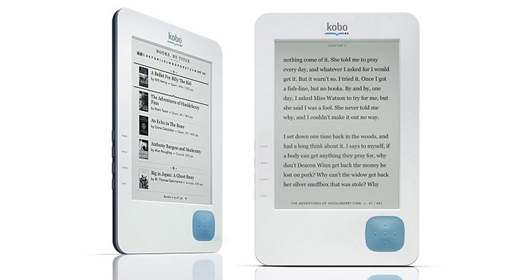 The Kobo doesn’t have on-board 3G or Wi-Fi, so books must first be downloaded to a PC or Mac, and then transferred to the Kobo via USB before they can be viewed. This is in contrast to the Kindle, Nook and iPad, which allow you to download books on the go – but Borders is probably betting that many people already have other devices capable of this connectivity and don’t really want to pay an extra hundred bucks for wireless access they don’t really need. Kobo is able to store 1000 titles with a claimed battery life of two weeks without recharge. The device even has a “hard quilted” back to give you that traditional feel of a hardcover book. The Kobo is undoubtedly a good looking piece of tech, with clean lines and quality plastics. All aspects of design aside, the most amazing thing about the Kobo is it’s price. At $149, the Kobo is $110 cheaper than Amazon’s Kindle and Barnes & Noble’s Nook, which both retail for $259. If nothing else, the Kobo is certainly going to put a lot of price pressure on the other big players in the ereader market. The Kobo is due to go on sale in the US in June.